Known by many as the “Father of the Modern Longboard,” Steve Walden shaped his first surfboard in 1961, at age 13, and never looked back. Eight years later, the native Southern Californian opened his first board factory and store in Huntington Beach, then moved to the North Shore of Oahu in 1972, where he made a name for himself as a prolific longboard shaper. While the rest of the surfing world was fixated on short single-fins, Walden continued to faithfully hone his longboard designs. Over the years he shaped for prestigious labels like Lightning Bolt, Local Motion, HIC, and Channel Islands, but it was always his own boards that set him apart. By the early 80s, Walden returned to California where he unveiled his wildly successful Magic Model with its radical rocker, down-turned rails, and super-fast Turbo Hull bottom contour. Walden currently operates a surfboard manufacturing facility in Ventura, California. He continues to actively compete in professional competitive surfing, and in fact holds the longest recorded nose ride in competition history. He attributes this feat to the excellence of his nose-riding design. His most recent industry precedent is a longboard designed specifically for the female surfer. 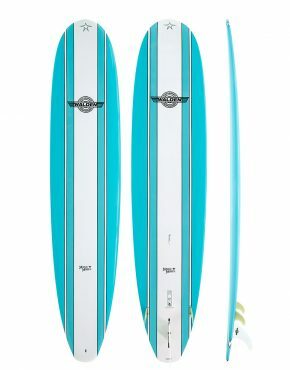 At Vertigo Surf we have a couple of Walden boards in stock with more coming in time for summer.